1.1. The Afternoon Express Alice Phoebe Lou Ticket Competition (Competition) will be run by Cardova Trading (Pty) Ltd in association with Rachelle Crous Publicity (Organisers/we/us/our). Entries for the Competition will open at 17h00 on Tuesday, 31 January 2017 and will close at 23h59 on Tuesday, 31 January 2017 (Competition Period). 5.1. We will randomly draw 1 (one) winner (Winner) by means of an automated system within 24 (twenty-for) hours from the closing date of the Competition Period. Late entries will not be considered. 5.2. We will contact the Winner within 1 (one) day from the prize draw on the cell phone number from which the entry was sent. If a Winner is not contactable within 1 (one) day from the prize draw, and after we have made at least 3 (three) attempts to contact the Winner, that Winner will forfeit the prize and we shall have the right to select a different Winner on the same conditions except that we shall only be required to make 1 (one) attempt to contact each further Winner drawn. 6.1. 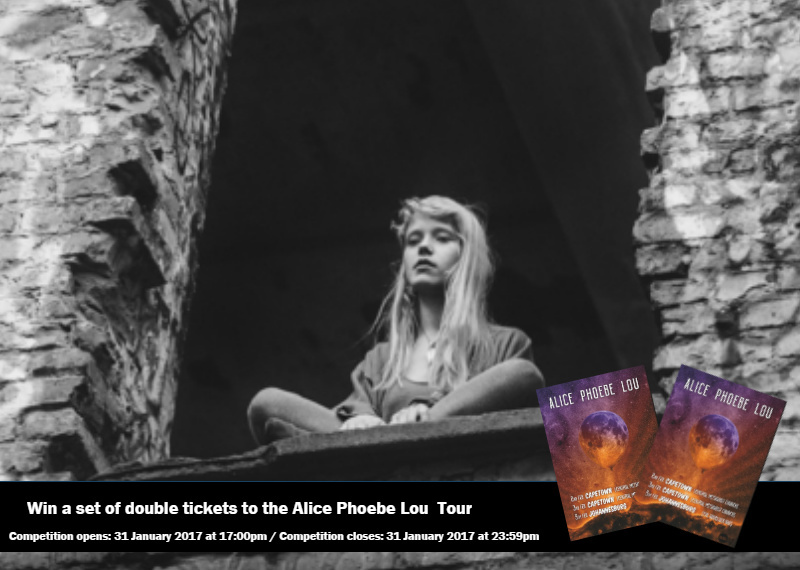 The Winner will receive 2 (two) tickets (Tickets), for the Winner and a guest, to attend the Alice Phoebe Lou Tour performance at the Goodluck Bar at 1 Fox Street, Johannesburg on the 5 February 2017 (Prize). 6.4. We will send the Tickets to the Winner within 3 (three) days from determination of the Winner. 6.5. If a Winner is for any reason unable to use a Ticket, we kindly request that he/she notifies us by 12h00, on 3 February 2017, so that the Tickets can be re-allocated.